Through a series of five walks this book discovers the sights, sounds and experience of the capital at war; it details the remaining tangible evidence of the dark days via air raid shelter signs, bomb damage on buildings and memorials detailing heroic and often tragic events. The new routes cover a wide area of London and reveal further evidence of the experiences of four years air war in the skies above our capital city. The East End & Docks, Greenwich, Holborn, Bermondsey, Southwark and the West End are all featured, along with detailed maps and numerous contemporary photographs that accompany the text for each walk. The book also contains a number of appendices relating to the wider picture of the war. A well deserved story of London’s Home Guard is told. A list of Civil Defense casualties that occurred within the boroughs covered by the walks is included as well as a detailed list of the locations of wartime fire and ambulance stations across the capital. This book will appeal to both the enthusiast and anyone with an interest in London’s past. It is a further record of the memories and tangible evidence of this dramatic period of our capital’s past and a tribute to those who lived through the Blitz and sadly so often, those who did not. 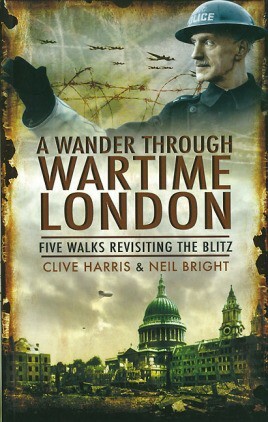 Clive Harris is a full time battlefield guide and lover of London. His previous books include Walking the London Blitz and The Greater Game – Sporting Icons Who Fell in the Great War.He lives in Hertfordshire and is a member of the Guild Battlefield Guides.